Hydraulic arbors operate by a displacement principle and by expanding metals within their elastic limits. This expansion is achieved by hydraulic pressure, a true, accurate, and equalized centering force. 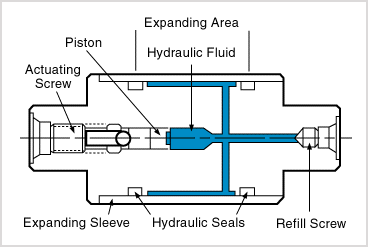 By turning the actuating screw, the piston forces the fluid from the reservoir through the ports up under the sleeve. The fluid expands the steel sleeve into the inside diameter of the part. The part is held by the pressure of this expansion force and locates the true centerline of the part. Expansion is approximately 0.003" for the first inch of diameter. 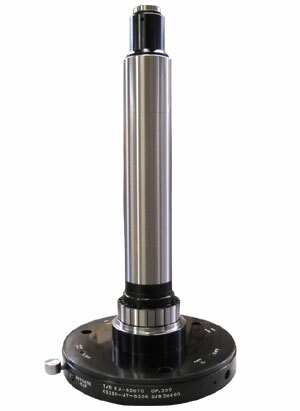 Add 0.002 inch expansion for each additional inch of diameter. Greater expansion can be obtained under certain design conditions. Our engineering staff will assist you on all designs. 0.0002 T.I.R. is normal for Jerry Tools. Closer tolerances can be held if required. Maximum arbor size - 48"